Athol Fugard, South Africa’s most influential playwright, has had his dramas on St. Louis stages many times in the past but we haven’t seen him represented in quite some time. Mustard Seed Theatre has righted that wrong with a powerful production of “Playland.” It crackles with strong dialogue and like so many of the issues in his plays, boils down to a one-on-one confrontation. 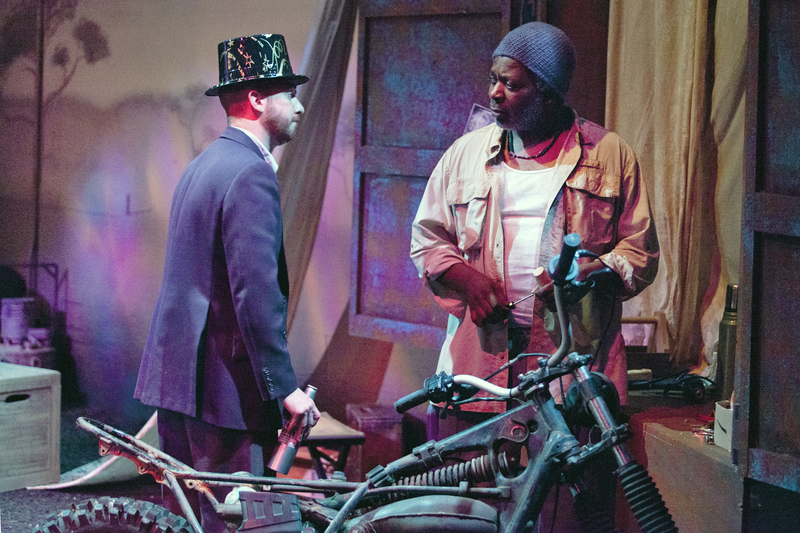 Charlie Barron and Erik Kilpatrick in Athol Fugard's "Playland" at Mustard Seed Theatre. Although issues of Apartheid, the South African Border War and the issues with the South West Africa People’s Organization are driving forces in “Playland,” the heart of the play is about two men and their “coming to an understanding” amid a clash of race and ideologies. Gideon, a veteran of the war that ended in 1989 creating Nambia, wanders into a remote amusement park in South Africa on New Year’s eve, 1989. He confronts the black security guard of the establishment, Martinus, and they immediately spar on several issues. Martinus extols the virtues of religion- particularly what he refers to as “The Sixth-” the sixth commandment- Thou shalt not kill. Gideon refers to his life as having suffered from a “bad dose of religious indigestion.” What evolves are two stories- the haunting of Gideon by his actions in the war, particularly involving the slaughter of 23 men witnessed by a young woman and her child, and Martinus and his story of breaking “The Sixth” after his wife is brutally raped by a policeman. Although they cannot overcome their differences on the war, race and religion, at the end of the play there is some compromise and a bit of mutual respect. Erik Kilpatrick gives a wonderfully nuanced performance as Martinus. Without raising his voice, he shows the range of emotions that his character goes through with the loud, brash and disturbed outbursts of Gideon. As the perfect foil, Charlie Barron brings an outward release to those emotions. It’s all brought to life with the strong direction of Mustard Seed’s Artistic Director, Deanna Jent. Playing out on a masterfully designed set by Courtney Sanazaro enhanced by the Bess Moynihan lighting design, “Playland” becomes a dichotomy of emotions for the audience with the bizarre- almost “Twilight Zone” surreal atmosphere of a carnival played out against the highly-charged stories of these two, diverse individuals. “Playland” brings Athol Fugard back to a St. Louis stage in fine fashion as we wrestle with the myriad of questions the play brings us. It plays at Mustard Seed Theatre at Fontbonne University through February 12th. Call them at 314-719-8060 or visit them at mustardseedtheatre.com for more information.